Second studio album. Blues and Roots straight for the heart. 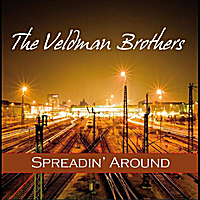 "The Veldman Brothers": A solid band moulded around "bloodbrothers" Gerrit and Bennie Veldman: Gerrit on guitar, Bennie on Hammond and bluesharp together with Marco Overkamp on drums and Donald van der Goes on bass. You I'l find "The Veldman Brothers" playing festivals as well as small blues joints and already they have managed to abash the audiences at every major bluesclub and festival in Holland. I can highly recommend this album of the Dutch, four piece, Blues Formation The Veldman Brothers. Bennie Veldman and brother Gerrit wrote all the songs, Bennie plays Hammond B3 and Harp and Gerrit is the Guitar player of the band. Donald van der Goes is the bass man and Marco Overkamp the drummer. Since 2006 they are together and this is their second studio album after a Live album last year. The 11 songs don't leave you bored thats for sure. It's shufflin', groovin' and rockin' all over the album. The Hammond B3 is played in a wonderful style, never too much but present, so that the ballads are one of the highlights on this CD. You don't hear much B3 these days and so is this a special event. On their first album "Home" the band sounded a bit rough but it was not bad, some people like that a lot. The new album is produced at high class and as I said earlier all songs are written by the band members, no more covers. The ballade "leavin'" is my personal hit, just perfect. Not overproduced, the instruments giving a nice smooth atmosphaere and the B3 got that wonderful sound. Target is another ballade almost acoustic, Everyday I Play the Blues starts with a Bass soli and then the B3 kicks in, a jazzy feeling is the result and that sounds great. The 7:20 minute Song "saw you there" got everything a good Bluessong needs. Guitar, Harp and a B3 solo. Slowly the song is developing into a finale grande with a wonderful voice of Gerrit.